Original Acrylic Painting. "Tranquil Breeze"
I love how this cherry blossom painting turned out.. the unique layout and asymmetrical placement of this painting gives a unique way to decorate your home above a couch, bed or even a stairway following the slop of the steps. The colors are soothing and calming. 56" by 36" over three stretched canvases. 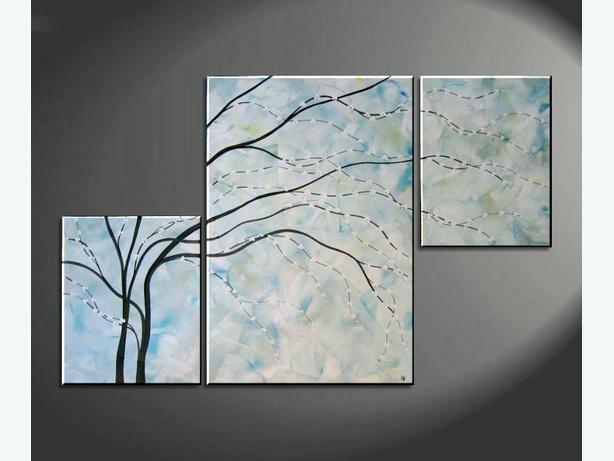 (Two 16x20 and one 24x36 canvas) This painting's colors are different shades of turquoise, light blues and greens with white for the background, dark brown branches and pure white for the blossoms. The blossoms stand out and give the painting texture and dimension.